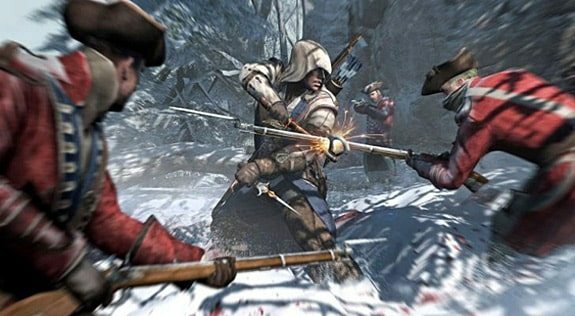 The combat system within Assassin’s Creed III has been “completely redone”, creative director Alex Hutchinson has shared. Now set for its fifth instalment, Ubisoft were keen to go entirely back to scratch, departing from that seen before within the series. This will now encompass what Hutchinson describes as a “two-handed combat system”, effectively allowing you to dual-wield weapons with early examples being the tomahawk and knife. A further confirmed addition to your assassin’s arsenal is the Chain Dart, which can be used to pierce the necks of your opponents. “The combat system in Assassin’s Creed III has been completely redone”, Hutchinson explained during an interview in the latest issue of Official PlayStation Magazine. “We burned it to the ground and we’re building it back up”. He continued, “At its base it’s a two-handed combat system, so all of the weapons are two-handed. Some of the cool new combinations include a tomahawk and knife. Connor also has a bow. “At first our research said basically that bows had been replaced by guns, but what we found was that a lot of the different tribes were still using them to hunt from horseback because the guns were so inaccurate. We thought it was a cool weapon, and still historically accurate”. Assassin’s Creed III is confirmed to release for Wii U later this year. It’s also confirmed to release for Xbox 360, PlayStation 3 and PC on October 30th in North America and October 31st across Europe.